When friends and family come to Fethiye on holiday, routine goes through the window and the kitchen becomes a tad neglected as we grab snacks here and there, en route to their hotels and apartments to meet up with them. Fortunately, in Fethiye, this habit doesn’t have to break the bank because there are little Turkish treats to be had – such as one of the best, most simple Turkish street food staples; tost. ‘Usta’ means ‘master’ and their title is deserved. For as long as we can remember, these purveyors of fine tost have been trading under the shade of the trees on the corner of Fethiye harbour, serving workers, school children, passers by and tourists. And, for as long as we can remember, apart from a recent face lift to bring it in line with the other buildings around Uğur Mumcu Park, nothing much has changed. You come to sit at Iksirci Tezcan in Fethiye to eat one thing only: tost! The chairs and tables had a fun paint job during the face lift process but they’ve always been the same, too. Tall people might struggle a bit as both the chairs and the tables are tiny – don’t even think about trying to tuck your knees under the table – but that doesn’t seem to bother the folks that flock here day in, day out. We’ve never seen this place empty and you’ll struggle for a table around lunchtime. As you can see from these photos, our eating times have been a bit unconventional of late and we managed to get to Iksirci Tezcan at a rare quiet spell. The menu board, along with prices, is nailed to the surrounding walls, but you won’t need to peruse it for long. You can either have a yarım tost (a half bread which you can see in the above photo) or a çeyrek tost (that’s the tost in the photo, cut in half – çeyrek means quarter). And, as is the staple with Fethiye’s snack bars these days, you’ll be asked if you want ketchup and mayonnaise inside it, too. We always go for a karışık yarım tost which is cheese and sucuk and, despite not being big fans of the ketchup mayonnaise fashion, we always say yes to the offer. It seems to work well on the tost. Because the kitchen area is such a continuous conveyor belt of pressed bread and fillings, your mixed tost is delivered to your table within a matter of minutes and, with it, a bowl of turşu. Of course, so busy is Iksirci Tezcan, the turşu bowls are pre-prepared, too, and stacked high on a shelf by the counter. In the case of Iksirci Tezcan, the turşu is pickled chillies and gherkins which are eaten with the aid of a cocktail stick – mmm, it’s always the little extras that make all the difference isn’t it. This side dish of turşu is the perfect accompaniment and, to be honest, just as important as the tost as far as we’re concerned! The thought of tost without turşu…oh, enough to make you shudder! How about this for a perfect thirst quencher on a hot, sunny day in Fethiye? Freshly squeezed mixed fruit juice. The great thing about Iksirci Tezcan is they have a regular supply of fruit which goes into their drinks but they also use seasonal fruits, too. So in summer, you might get melon in your fruit juice whilst autumn brings with it the wonder of the pomegranate. 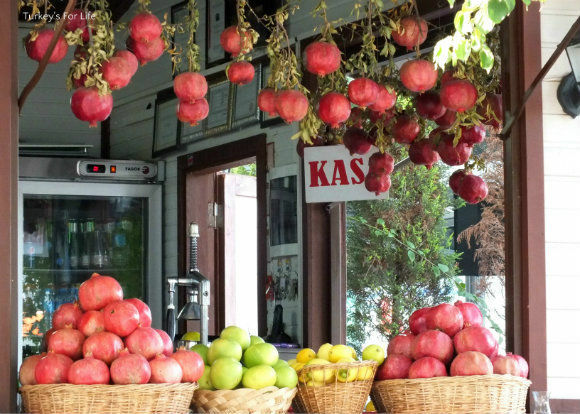 Pomegranate season at Iksirci Tezcan – what would you mix them with? …The next great thing about İksirci Tezcan…if you’re in Turkey on a budget, this is the place for you. 3 TL gets you a yarım tost. This mixed fruit juice is the most expensive drink on the menu – that’s 3 TL, too. 6 TL (around £1.50) to sit and watch the world go by along Fethiye harbour, fill yourself up and then quench your thirst with a healthy vitamin boost. Now that has got to be a bargain for anyone, hasn’t it? Iksirci Tezcan is the cream wooden-look building on Fethiye harbour at the side of the Fethiye Culture Centre (the big blue building). You can view its location here on our map of Fethiye. If you’re not a fan of mixed fruit juice, they’ll also make a glass up of your preferred fruit. Iksirci Tezcan is open daily until evening, all year round. Visit our Fethiye Eating and Drinking page for more ideas of where to eat snacks and more substantial meals around the whole area. Of course, there are a few bar suggestions on there, too. another thing i have to learn to make..yum! Careful if you try this in Bodrum. 2 inferior toasts and 2 small beers at the Municipality cafe on the from, a staggering 28 TL – More than £10. . . first ordered one of these more than 20 years ago on a visit. The lady wandered across the street to the market, took a bread from the cupboard, wandered back and a few minutes later the biggest toasty I’d ever seen was dished up. It was delicious and I’ve been a toasty freak ever since. @ BacktoBodrum: Wow!! Municipality owned, too? No beers here in Fethiye but the fruit juice makes up for it. Try “ayvalık tostu” next time, you definitely won’t regret. And you can say what do you want in your mixed fruit juice. But if you let them to prepare their recipe it will be the cost effective one for them, which is usually local fruits like orange, grapefruit, lemon, grape, banana, carrot. looks like it is a great place to eat on your travel.